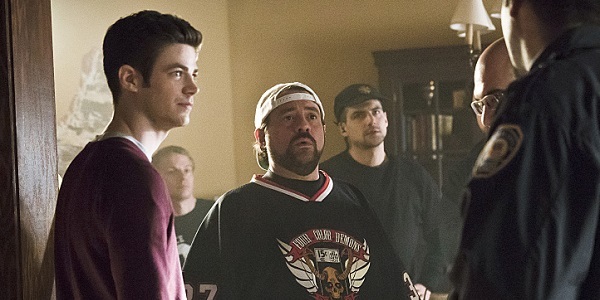 Tonight’s episode of The Flash is not only notable for being one of the final installments of Season 2, but also for having the comic-fluent filmmaker Kevin Smith behind the camera. We already know that the ep is going to bring back Girder as the trouble-causing villain, but Smith has another idea for a bad guy he’d like to use on the show in the future: the blam-eriffic killer Onomatopoeia . I would love to jump in for a one or two episode arc just to bring that Onomatopoeia character to life. That would be so badass – I created this character in the comics and then to do a live-action version of it that fit into their universe, fit into the run of their show? That would be exciting to me. That would be a pretty interesting and seemingly singular event, to have an episode director also serving as one of the character’s creators. 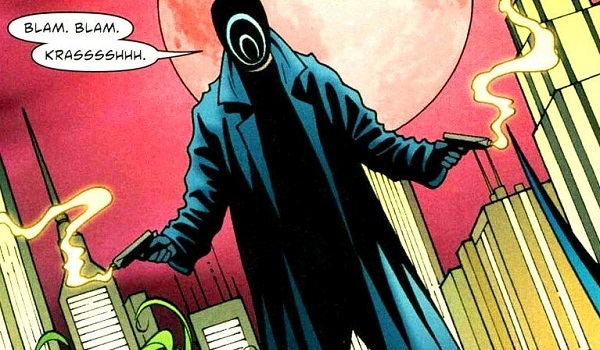 Kevin Smith brought to life the hero-murdering Onomatopoeia for an issue of Green Arrow back in 2002, and the mysterious antagonist has since made various appearances in both Green Arrow storylines and those of Batman. There was talk of him actually appearing on Arrow in the past, but it never came to be, largely because Smith has been vocal about the villain not making sense for a live-action adaptation. But he said all that before comic book TV became an entertainment cornerstone, so we forgive him. The Flash has already made it clear they’re bringing Smith back to direct at least one more episode for Season 3, and there’s no reason to think they wouldn’t allow him to take on a two-episode arc if the inclusion of Onomatopoeia makes sense within the show, since everyone was so happy with the experience that led to “The Runaway Dinosaur.” Smith told Variety that while he isn’t interesting in writing any Flash episodes in general, he would absolutely be into penning the script(s) for a potential Onomatopoeia story. And let’s be real here. Onomatopoeia would likely fit in much better in the world of The Flash, even if he’s a violent killer that doesn’t necessarily have any obvious metahuman powers. He’s a super-smart martial artist who’s good with weapons, with a schtick that involves mimicking the sounds of his weapons and whatnot. It’s kind of a goofy detail that could easily be made creepy, but I think that guy and Cisco would have great conversations. But before we get to any noisemaking baddies in Season 3, we still have to make it through the remainder of Season 2, so that we can see what the hell happened to Barry during the particle accelerator explosion reproduction. As well as how Barry gets to see his mom again. Not to mention Zoom and the Man in the Iron Mask and everything else that still hasn’t reached a resolution. So much left to go! With just three episodes left, The Flash airs Tuesday nights on The CW.